We believe that everyone should be able to have the titanium ring, or wedding ring of their choice, regardless of their finger size, so we don't just concentrate on the more commercial sizes but also include as standard, within our range a large selection of Men's titanium rings, and wedding rings that are available in larger finger sizes, typically up to UK size Z+6, all from stock. We also do not charge any extra supplement for our larger sizes so you will always pay the same price as our standard finger sizes. 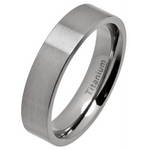 Our Titanium Rings in Large Finger Sizes have been rated 10 out of 10 based upon more than 99 customer reviews.